The award-winning poet discusses her collection, a place called No Homeland. Kai Cheng Thom's website describes her as "a fiery writer, performer, spoken word artist and drag dance sensation." She has taken her poetry from the stage to the page in a place called No Homeland, which is an intimate journey through topics like gender, race and sexuality. Many of the poems emerge from her story of navigating identity as a Chinese Canadian transgender woman. This interview originally aired on Jan. 22, 2018. Cheng Thom won the 2017 Writers' Trust of Canada's Dayne Ogilvie Prize for LGBTQ emerging writers. 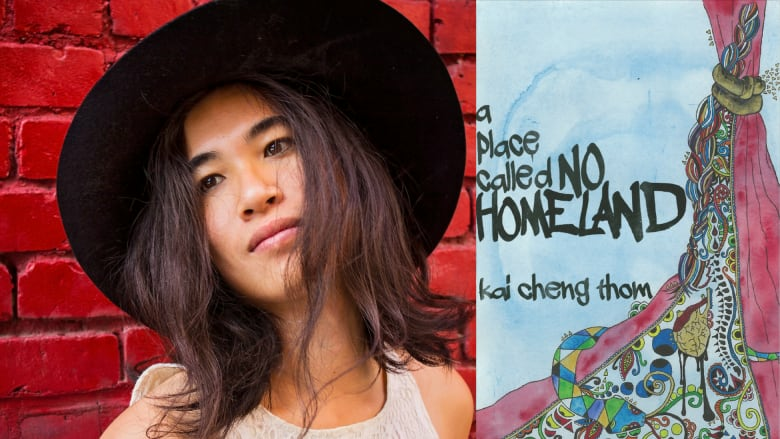 "a place called No Homeland is a semi-autobiographical book of poetry that draws on spoken word, lyric poetry and oral storytelling traditions. It tells the story of a little Chinese boy in Vancouver who grows up to become a monstrous woman living out her fairytale life of love, pain and growth in Montreal. There's definitely a vulnerability to putting one's private life out into the public. Friend and fellow writer Ivan Coyote once said that there is a vulnerability in remaining silent about what one experiences. I think about this a lot. There is a huge amount of power in taking those private hurts and bringing them into the public and saying, 'I reclaim these for myself!' It feels less safe for me not to write about my private life because it means I have something to hide." "Unfortunately, the gay community is not immune from any other kind of prejudice. I think there is a lot of wishful thinking among the gay community that we can't possibly be racist because we've experienced oppression. Coming out as a young person first in Vancouver and then in Montreal, I discovered that was not at all true. There is a racial, ability and beauty hierarchy in the gay community that is just as bad, or maybe worse, as in the straight community. The hardest betrayal for me is that the message of the gay community in the late 1990s was one of great acceptance. That wasn't what I've found and I wanted to write about that. I thought it was really important to talk about because so many of us who live LGBT or queer lives are not white."